In elliptical galaxies, all stars were formed billions of years ago, and there are no gas from which could be produced new stars, so it was thought that their star formation stopped. Because of that scientists believed that they was “dead” galaxies, which stopped doing the star for a long time. But new studies of astronomers from the University of Michigan (USA) by the Hubble Space Telescope show that ancient elliptical galaxies, which were previously considered “dead” able to produce new stars.Astronomers, using wide-angle camera WFC 3, installed on the Hubble Space Telescope, studied star clusters in four galaxies located at a distance of about 40 million light-years from Earth. During the observation of an elliptical galaxy M 105, located 34 million light-years from Earth in the constellation Leo, astronomers found a few bright blue stars, and also number of their clusters. 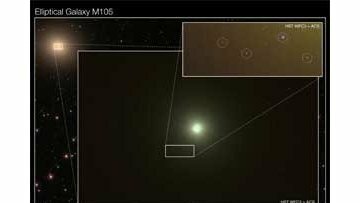 According to this astronomers found that the formation of new stars in the galaxy continues, with speed of one star, with the mass of the Sun, nearly for 10,000 years. But have to say that they don’t know from where could take the gas from which new stars are formed. Next Next post: Is Exist White Holes ?